A first-half brace by Oxford's James Constable gave them a first win away at arch rivals Swindon Town in 38 years. The U's striker's powerful downward header from a corner was cancelled out by Matt Ritchie's headed goal from Callum Kennedy's cross. Oxford were back infront before half-time when Peter Leven's parried free-kick went in off Constable's chest. 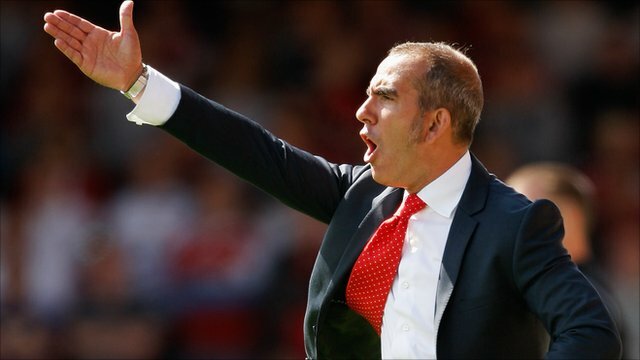 Swindon toiled for an equaliser after the break as boss Paolo Di Canio was sent to the stands. All the pre-match talk was centred on Oxford striker Constable and it was the U's man who struck first when he rose unchallenged at the near post from Leven's outswinging corner to power in a downward header past Swindon keeper Phil Smith. Swindon's goal eight minutes later was no more than the hosts deserved after a fabulous late cross from Kennedy was met by Ritchie who leapt above Oxford's defenders for his first goal of the season. Oxford keeper Ryan Clarke pulled off some fine saves before the break as Swindon began to gain the ascendancy. The hosts conceded a free kick on the corner of their area on 42 minutes and Leven whipped in a vicious ball that Smith parried only to rebound in off Constable. Seven minutes into the second half Leon Clarke had an opportunity to score on his Robins debut but was ruled offside after creating a one-on-one with the keeper. Di Canio was incensed and, following his reprimand for overzealous celebrations at Swindon's goal, was sent to the stands. Clarke blasted over the bar minutes later from close range after Ritchie put him clear as Swindon dominated the midfield exchanges. Lander Gabilondo forced a great save from Ryan Clarke as the home side continued to pepper the U's goal with Oxford defending deeply. Both keepers were called upon in the dying minutes as Ritchie and Constable were denied chances to increase their tallies before Gabilondo fired a great chance wide at the death. "They [Swindon] dominated the game. For 85 minutes we were the team that should win. "Today was the best performance of the season but we again conceded two goals in two set plays." "I thought we hung in there but [I think about] last year the amount of times we played well and came away with nothing - today we put a shift in. "The supporters won't give a monkey's about how we've played and, to be honest about it, neither do we. "It's all about the three points on derby day." 90:00+4:17 Effort on goal by Lander Gabilondo from deep inside the penalty area misses to the right of the goal. 90:00+2:54 The referee ends the match. 90:00+2:45 James Constable takes a shot. 90:00+0:15 Matt Ritchie has an effort at goal from 20 yards. Save by Ryan Clarke. 88:42 James Constable takes a shot. Phil Smith makes a save. 85:56 Inswinging corner taken right-footed by Lander Gabilondo from the left by-line to the near post, clearance made by Paul McLaren. 83:42 Damian Batt challenges Lander Gabilondo unfairly and gives away a free kick. Free kick crossed left-footed by Callum Kennedy from left channel, Jake Wright manages to make a clearance. 81:09 Effort from 25 yards by Lander Gabilondo. Save by Ryan Clarke. 78:14 The ball is sent over by Lander Gabilondo. 77:43 Ryan Clarke fouled by Alan Connell, the ref awards a free kick. Ryan Clarke takes the direct free kick. 75:59 Effort from 35 yards by Callum Kennedy went wide right of the target. 75:14 Michael Duberry gives away a free kick for an unfair challenge on Alan Connell. Free kick crossed left-footed by Callum Kennedy from left channel, Asa Hall makes a clearance. Correction - 73:52 Substitution Alfie Potter goes off and Damian Batt comes on. 73:30 Substitution Damian Batt is brought on as a substitute for Alfie Potter. 72:12 Shot by Matt Ritchie from a long way out goes over the net. 71:31 Inswinging corner taken by Simon Ferry, Asa Hall manages to make a clearance. 70:05 Substitution Lander Gabilondo comes on in place of Etienne Esajas. 69:19 Matt Ritchie takes a corner. 66:20 Liam Davis takes the direct free kick. 66:20 Substitution Alan Connell replaces Mehdi Kerrouche. 66:20 Unfair challenge on Deane Smalley by Aden Flint results in a free kick. 62:23 Corner taken left-footed by Matt Ritchie to the near post, clearance by Paul McLaren. 59:25 Free kick awarded for a foul by Leon Clarke on Michael Duberry. Free kick taken by Ryan Clarke. 58:38 Leon Clarke produces a left-footed shot from inside the area that goes over the bar. 57:41 The free kick is delivered left-footed by Callum Kennedy from right channel, Michael Duberry manages to make a clearance. 57:41 Booking Asa Hall shown a yellow card. 57:33 Free kick awarded for an unfair challenge on Jonathan Smith by Asa Hall. 56:45 Foul by Joe Devera on Deane Smalley, free kick awarded. Free kick taken by Peter Leven. 54:42 Substitution Deane Smalley is brought on as a substitute for Lewis Guy. 52:56 Leon Clarke is flagged offside by the assistant referee. Free kick taken by Michael Duberry. 48:27 Substitution Simon Heslop goes off and Asa Hall comes on. 45:02 Substitution Mehdi Kerrouche replaces Raffaele De Vita. 45:00+4:31 The match has reached half-time. 45:00+3:49 Aden Flint fouled by James Constable, the ref awards a free kick. Direct free kick taken by Phil Smith. 45:00+3:12 Lewis Guy fouled by Paul Caddis, the ref awards a free kick. Ryan Clarke takes the direct free kick. 45:00+0:57 The free kick is delivered left-footed by Callum Kennedy from right wing, clearance by Andrew Whing. 45:00+0:57 Booking Booking for Liam Davis for unsporting behaviour. 45:00+0:44 Liam Davis gives away a free kick for an unfair challenge on Paul Caddis. 45:00+0:09 Paul McLaren challenges Callum Kennedy unfairly and gives away a free kick. Direct free kick taken by Phil Smith. 42:10 The assist for the goal came from Peter Leven. 42:10 GOAL - James Constable:Swindon 1 - 2 Oxford Utd James Constable finds the back of the net with a goal from close range to the bottom right corner of the goal. Swindon 1-2 Oxford Utd. 40:37 Free kick awarded for a foul by Jonathan Smith on Alfie Potter. Free kick crossed left-footed by Peter Leven, save by Phil Smith. 38:48 James Constable fouled by Joe Devera, the ref awards a free kick. Michael Duberry takes the free kick. 38:03 Free kick awarded for a foul by Andrew Whing on Raffaele De Vita. Direct free kick taken by Callum Kennedy. 37:14 Matt Ritchie produces a right-footed shot from just outside the penalty area that goes harmlessly over the target. 34:08 Shot from 25 yards from Matt Ritchie. Save made by Ryan Clarke. 32:37 Raffaele De Vita takes a shot. Save by Ryan Clarke. 30:03 Inswinging corner taken from the left by-line by Simon Ferry, Header from deep inside the penalty area by Leon Clarke goes harmlessly over the crossbar. 29:05 Free kick awarded for a foul by Paul McLaren on Raffaele De Vita. Free kick crossed by Callum Kennedy, Michael Duberry manages to make a clearance. 28:29 Aden Flint challenges Ryan Clarke unfairly and gives away a free kick. Direct free kick taken by Ryan Clarke. 27:57 Corner taken by Matt Ritchie from the right by-line played to the near post, Liam Davis makes a clearance. 26:55 Shot by Etienne Esajas. Blocked by Andrew Whing. 25:56 Simon Ferry takes the inswinging corner, James Constable makes a clearance. 24:00 Paul Caddis produces a right-footed shot from the edge of the box and misses to the left of the goal. 19:48 The assist for the goal came from Callum Kennedy. 19:48 GOAL - Matt Ritchie:Swindon 1 - 1 Oxford Utd Matt Ritchie scores a headed goal from close in. Swindon 1-1 Oxford Utd. 18:19 Headed effort from deep inside the penalty area by Leon Clarke misses to the right of the target. 17:02 Unfair challenge on Matt Ritchie by Simon Heslop results in a free kick. Simon Ferry crosses the ball from the free kick right-footed from left channel, Michael Duberry makes a clearance. 15:52 The referee penalises Liam Davis for handball. Free kick crossed left-footed by Callum Kennedy. 14:47 Effort from outside the penalty box by Leon Clarke goes wide left of the goal. 13:39 Shot from just outside the penalty area by Peter Leven misses to the left of the target. 12:11 Free kick awarded for a foul by Raffaele De Vita on Jake Wright. Direct free kick taken by Jake Wright. 11:13 The assist for the goal came from Peter Leven. 11:13 GOAL - James Constable:Swindon 0 - 1 Oxford Utd James Constable finds the net with a headed goal from close range. Swindon 0-1 Oxford Utd. 10:29 Liam Davis fouled by Matt Ritchie, the ref awards a free kick. Direct free kick taken by Peter Leven. 8:50 Free kick awarded for an unfair challenge on Lewis Guy by Paul Caddis. Free kick taken by Peter Leven. 6:52 Liam Davis gives away a free kick for an unfair challenge on Paul Caddis. Callum Kennedy delivers the ball from the free kick left-footed from right wing, Ryan Clarke makes a comfortable save. 6:26 Lewis Guy takes a shot. Save by Phil Smith. 4:38 Inswinging corner taken by Simon Ferry from the left by-line played to the near post, Michael Duberry makes a clearance. 3:59 Raffaele De Vita fouled by Liam Davis, the ref awards a free kick. Free kick crossed left-footed by Callum Kennedy. 3:10 A cross is delivered by Paul McLaren. 2:28 Raffaele De Vita gives away a free kick for an unfair challenge on Paul McLaren. Free kick taken by Michael Duberry. 1:36 The assistant referee signals for offside against Alfie Potter. Phil Smith takes the indirect free kick.